Generally when slurring down aim for a note below the one you want with your embouchure. 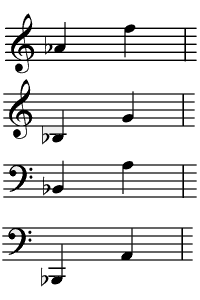 The lower note is then less likely to split and is quickly and easily brought up to pitch if necessary. Downward from notes with half holes, eg octave Gs: when you slide your half hole closed the action is not sudden enough so I take my half hole off completely and then bring the finger down quickly to close the hole. This has the added advantage in that the upper note will tend to be a little sharper with an open hole rather than a half hole and so you will need to lip it down making the embouchure difference less between the two notes. Slurring down to a half-hole Ab can be tricky. Try closing the half-hole completely and touching the A vent key at the start of the note. Quickly release the key and restore the half-hole in order to avoid a nasty noise! Slurring up to Eb and E above middle-C leave off the first finger of your right hand. Use the vent keys of the left thumb when slurring to A, Bb, B or middle-C. For D use vent key or fingers 2 & 3 and the F-key of the right hand.